Kevin Murphy Young Again Immortelle Infused Treatment Oil won’t go unnoticed not only due to the very original design. The treatment is based on the oil extracted from the Immortelle flowers, and a few additional plant substances. It delivers nutrients and rejuvenates the hair. Unfortunately, it is one of the most expensive oils and its action is aimed at only one problem. … are based on the antioxidant properties of Immortelle flowers. Thanks to them, the oil prevents oxidisation, fights harmful free radicals and keeps the hair and scalp from ageing. Sadly, such changes are not clearly visible. Kevin Murphy Young Again delivers lustre and smoothness if it is used regularly. Most of all, the product nourishes and protects. It shields against the environmental factors and heat styling. Hair is supposed to look younger thanks to the oil. … is rich in natural plant extracts. There are only two oils, excluding the needless essential oils. Even the Immortelle Oil turns out to be an extract. There are seven more plant extracts that provide poorer action. That is the end of natural ingredients. 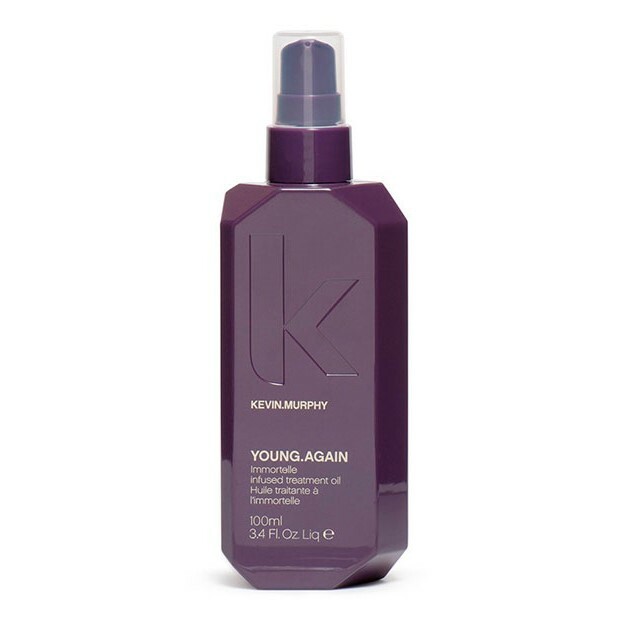 Kevin Murphy Young Again is based on a set of silicones. To make things worse, it contains many potentially harmful substances e.g. fragrances, preservatives. … is often compared to a regular drugstore hair serum. It is a downside, considering the price. The aroma is not the asset; it won’t appeal to every woman. Some call it fresh and nice whereas others – very irritating. Its consistency won’t work for those who usually use lightweight oils. Kevin Murphy Young Again Oil is very thick and resembles a syrup, which makes the application much harder. It is also the reason why the product may weigh the hair down. … can be found on the official website in brief. The information says we must apply Kevin Murphy Young Again Oil to freshly washed hair, before applying any hairstyling products. It is advisable to apply the oil once again to smooth the strands and prevent static, after blow-drying and styling. The product is not all-natural so it shouldn’t be used for scalp care and hair oiling (e.g. overnight). … is very modern and completely different than typical oil products. The design is the characteristic of Kevin Murphy products. The bottle is neither round nor rectangular – it has five sides and it is angular. It has plain purple colour. The packaging is decorated with nothing more but simple, white writing and carved K (the brand’s mark). Despite being made of plastic, the unique bottle catches the eye. A standard small pump works as the applicator.